Rub seasonings onto both sides of steak. Place on grill over medium to medium-high heat. Cook about 10 minutes on first side. Flip once and cook another 8 minutes for medium rare. Take off grill and let rest for at least 5 minutes. Place oil into sauté pan. Over medium heat, allow oil to become warm. Thinly slice pepper and onion. Add to pan and allow them to cook until they softened. Keep warm until ready to serve. Cut avocado in half. Score the fruit into small sections. Spoon out avocado and place in a medium bowl. Add tomatoes, onion, lemon juice, and salt and pepper and gently stir. Cover and refrigerate until ready to serve. I like to place everything on a large platter so each person can easily serve themselves. 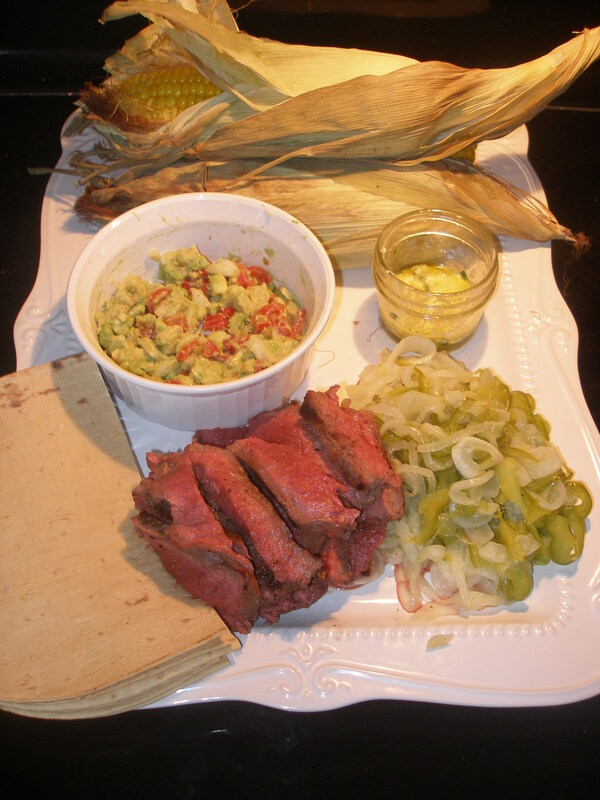 Fill a tortilla with steak, onions and peppers, and top with the guacamole. Fiesta! Preheat oven to 350 degrees. Keep husks on- they have a ton of flavor that seeps into the corn! I trim any excess husk/silk off the top to avoid scorching. Simply place the cobs on a baking sheet and allow them to roast for about 45 min to an hour. To check for doneness, gently squeeze the cobs to see if the kernels are soft. Allow to cool for several minutes before peeling back husks- the corn gets hot! Serve with cilantro butter. Cilantro Butter- Scoop out the desired amount of Smart Balance spread that will be used for the corn. Allow it to come to room temperature. Finely chopped fresh cilantro and stir it into the softened butter. Place it back into the refrigerator until you are ready to serve.